ochs und junior is a watch company which requires discovery. People discover us through word of mouth, when doing internet research, and when members of the media take interest in our story. Now on newsstands around the world, ochs und junior is featured in a 3-page article in Surface magazine issue 107. Surface features extensive coverage of architecture and design. Issue 107 also includes an interview with the Italian architect Renzo Piano. The thoughtful ochs und junior article was written by Stephen J. Pulvirent, the associate editor of HODINKEE. While Oechslin may not be a very public figure, he has made significant technical contributions to the field. He masterminded high-profile complications for well-known manufactures like Ulysse Nardin and, until February, served as director of the Musée International d’Horlogerie for 13 years. That he cut his teeth restoring the Vatican’s Farnese clock—an astronomical clock that displays the position of the earth and sun, along with phases of the moon—only adds to his mystique. Ludwig Oechslin might just be the greatest watchmaker you’ve never heard of, and his Ochs und Junior line of handmade timepieces might just create an entirely new segment of “anti-luxury” watches. Devoid of the “complications for complications sake” mantra that has permeated the Swiss watch industry over the past decade, the Lucerne-based horologist offers the full range of Pantone colors for the watch’s dial and hands, giving customers numerous options. Coupling bespoke design with the brilliant functional simplicity of cogs and wheels (instead of the more volatile levers and switches), Ochs und Junior sets a new standard for both customization and technical precision. I was so impressed by what Oechslin offers that when I wanted to celebrate five years cover- ing the watch industry, I did so with an Ochs und Junior timepiece. As an expression of gratitude to our audience, Hodinkee gave the watch to one of our readers; we selected a timepiece that represented not only ourselves, but what we thought was the very best that this industry could do. As someone who owns watches from dozens of manufactures in a range of vintages and price points, I can say there isn’t a single more satisfying timepiece to wear than an Ochs und Junior—it makes you feel like, for once, you’re part of the solution, not the problem. The theme of Surface issue 107 is “Endorsements.” For this special issue, respected authorities write about an up-and-coming company, designer or architect in their field. 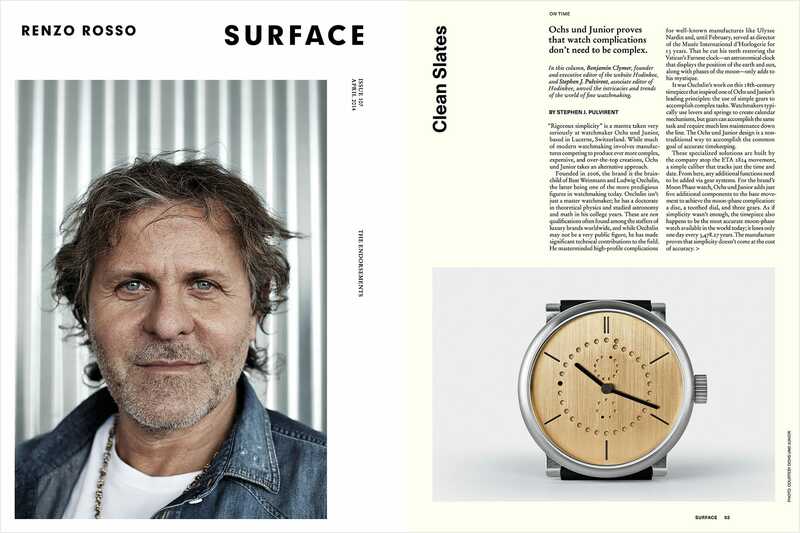 Pulvirent and Clymer are frequent contributors to Surface magazine, and chose to write about ochs und junior for the Endorsements issue. Also, a little behind-the-scenes information. We took the photos now featured on our store pages after being informed that Surface was writing this article about us. We were so happy with how the photos for Surface turned out, that we updated every image in the store to match them.